The vector e has the same components along the body axes and along the reference axes. 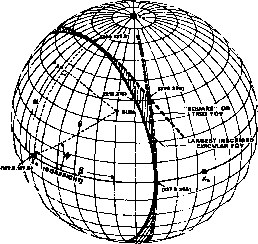 Thus, e is a vector along the axis of rotation. The existence of e demonstrates Euler's Theorem: the most general displacement of a rigid body with one point fixed is a rotation about some axis. We regard the direction cosine matrix as the fundamental quantity specifying the orientation of a rigid body. However, other parameterizations, as summarized in Table 12-1 and discussed more fully below, may be more convenient for specific applications. In each case, we will relate the parameters to the elements of the direction cosine matrix. Our treatment follows earlier work by Sabroff, et a!., f-'965].